Re-Kindle Your Creativity during our seven-day writing workshop in the picturesque highlands of Guatemala. We’ll journey from the colonial era town of Antigua to the famed craft market in Chichicastenango, staying at one of the country’s leading (and oldest) hotels, the Mayan Inn. 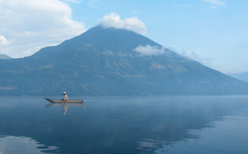 Then we’ll head to Lake Atitlán with its majestic body of water and traditional Mayan villages. Let the stirring landscape and colorful culture stimulate your senses and bring life to your written words. The writing portion of our tour will take place in Santiago Atitlán, the capital of the Tzutujil Maya Nation and the largest Indigenous town in Central America. 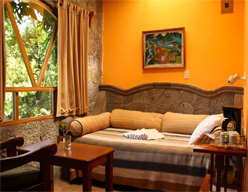 Our accommodations at the Posada de Santiago are cozy and charming. Crafted from volcanic stone, the hotel’s cottages blend modern amenities with nature and local craftsmanship. The gift of time to write. The gift of inspiration, and of experienced support. That is what we will have together at magical Santiago, Atitlán. Mary Jo McConahay is the author of Maya Roads, One Woman’s Journey Among the People of the Rainforest, winner of the prestigious 2012 Northern California Book Award for Best Creative Nonfiction, and named a Book of the Month by National Geographic Traveler Magazine, which called Maya Roads;an extraordinary literary journey, and a moving testament to a region and a life. Mary Jo was recently named the Lowell Thomas Travel Journalist of the Year, an award equivalent to the Pulitzer Prize in the genre.Her ebook, Ricochet, Two women war reporters and a friendship under fire, has recently been released to rave reviews. Mary Jo has led a full-time writer’s life, working as a journalist for newspapers covering war, environment, politics, personalities and women’s issues, her magazine pieces in Vogue, Time, Newsweek, Rolling Stone, the Los Angeles Times Magazine and many others. She has worked as an editor, and taught magazine writing at the University of California Extension in San Francisco. Mary Jo's stories are featured in Best Women’s Travel Writing, and Best Travel Writing 2011, both from Travelers‘ Tales. She has received two Solas Travel Writing Awards, including First Place Gold in the category "Food and Travel," as well as recognition from Go Nomad for "Navigating a Hypercity: San Paulo", a story they named as one of their top ten for 2012. Her recent coverage of the Guatemala genocide trial received the first place award for Best News Writing, International Event, from the Catholic Press Assn. of the United States and Canada. Mary Jo's new book, Tango War, The Struggle between the Allies and the Axis for Latin America during World War II is coming from MacMillan in 2017. Mary Jo loves this part of the world and knows it well. She raised her daughter, now in her 20s, in Guatemala from age two. She has worked at writing from Mexico to Argentina. In all the hemisphere, she says, Lake Atitlan has a unique spirit of place, perfect for drawing out feelings, narratives and ideas, and for working hard at the craft of writing them down. What do you write? What do you want to write? Good travel stories? A memoir or a novel? Stories about food that tell us something about the world, or ourselves? Creative nonfiction? A legacy history for your family, and yourself? Is your aim to publish what you write? If you already have pages you want to work on, you can send them to Mary Jo ahead of time, so we can hit the ground running. This will be a small group -- ideal for Mary Jo as facilitator to give individual attention to each writer. We will work on structure, and voice. Feedback and thoughtful critique are central to developing the craft. We can give that to each other too, in these days, as much or as little as each writer wants. Already have a book-length manuscript? Ask about advanced writers options. Learn more about Mary Jo here. Bienvenidos! We'll meet at the hotel in Antigua for wine and introductions before visiting with a Maya priest who will perform a ceremony petitioning for good work. Attending is purely optional–it's an indigenous custom for new endeavors. Afterwards we'll dine on traditional Guatemalan fare at one of the town's best restaurants. Get acquainted with your fellow students and learn about the week's exciting activities. After breakfast we’ll travel to Lake Atitlán and the lovely Posada de Santiago, our retreat center for the next four days. Afternoon writing class. Cocktails and dinner overlooking the picturesque lake at sunset. Morning writing class. 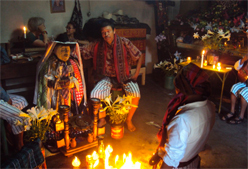 Then discover the nearby Mayan village of Santiago de Atitlán on a guided walking tour. Free time to write. Dinner. Today we’ll boat to Panajachel, an active tourist town with sidewalk cafés and numerous shops. Enjoy lunch on your own before heading back for an afternoon writing class. Dinner at the Posada. Today will be devoted to writing. After a morning class and lunch, take time to work on your own project...or paddle one of the Posada's canoes into the lake...or just relax in the jacuzzi and treat yourself to a massage. We;ll explore lakeside villages with their colorful arts and crafts. Afternoon class. Sunset cocktails and farewell dinner. We'll head to Chichicastenago after breakfast, transferring to one of the country’s leading (and oldest) hotels, the Mayan Inn. Lunch, then explore the village on your own. Afternoon writing class. Dinner at the Mayan Inn. Explore one of the world's most fascinating markets where villagers from all over Guatemala gather to sell their work: textiles, carvings, clothes, jewelry, as well as fabulous food stands with homemade blue corn tortillas. Lunch on your own. We'll travel back to Antigua in the late afternoon where you can catch a shuttle to the airport or stay a few extra days and enjoy more of Guatemala. The retreat price includes seven nights deluxe accommodations–double occupancy, all meals, except for two lunches during free times (Panajachel and Chichi), day trips and local transportation starting and ending in Antigua. Also included are 15 hours of writing class and 2 hours of private time with Mary Jo. Two private one hour mentoring sessions will also be scheduled during the retreat. Not included: transportation to and from Antigua, but we'll be happy to help you with the arrangements. We can also accommodate a friend or spouse who wants to join the tour but not attend the writing classes: The cost is $1600 with double occupancy. A $1000 deposit is needed to secure your place in our Guatemala Experience. Since the number of participants is limited and accommodations vary, early registration for the writing workshop is advised. The balance is due 60 days prior to departure. If not received by that time, EAT-WRITE-TRAVEL reserves the right to cancel your reservation. *itinerary subject to change depending on local festivals and markets.